Aren't these luscious-looking plums? 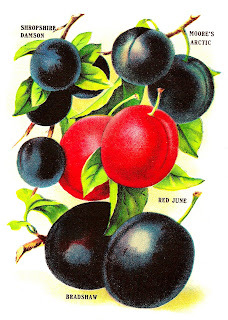 This piece of fruit clip art of plums is from a vintage seed catalog and it shows four varieties of plums: Shropshire Damson, Moore's Arctic, Red June, and Bradshaw. I hope you enjoy!